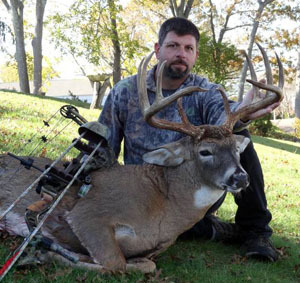 Check out some of the bigger 2011 New York Whitetails. If you or someone you know has a nice buck that you'd like to showoff. Just email a quality pic to nyantler@twcny.rr.com and I will add it to the page. 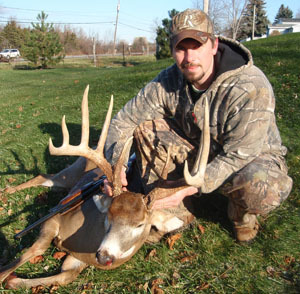 Jared McCargar with his 13-point non-typical taken in Onondaga County on Nov. 21,2011. The buck dressed out at 184 lbs and grossed 164 3/8. 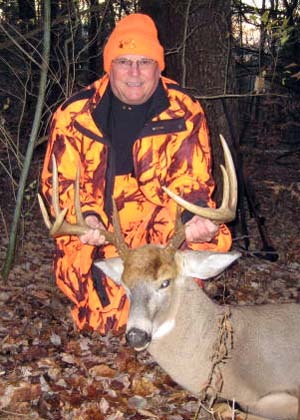 Martin Hale of Cato,NY shot this Northern Cayuga County 12-point buck on 11/20/11 with a Remington 1187 scoped 12 gauge. Marty's buck dressed out at 185lbs and has a 20 3/4" inside spread. It has a gross score of 171 2/8", net score of 159 4/8" with bases over 5 1/2" on each side. 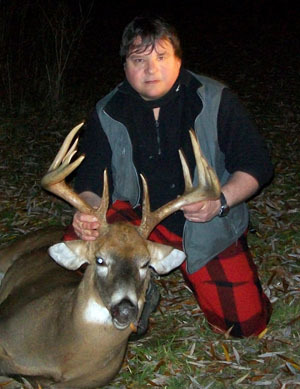 Robert Horton poses with his 10-point taken in Branchfield, NY (Yates County)in November of 2011 from his treestand. The Buck scored 139 B&C. 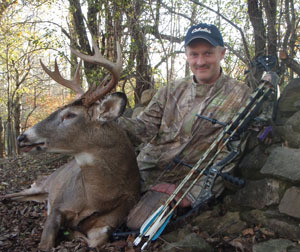 Jeff Henry arrowed this buck on October 26, 2011. 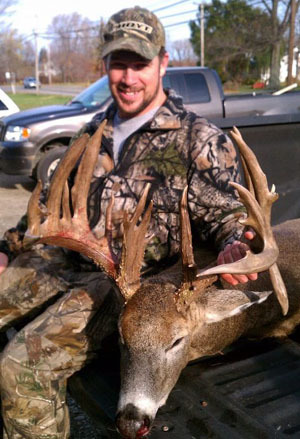 The Madison County buck weighed 220 lbs and officially scored 160 3/8 B&C. 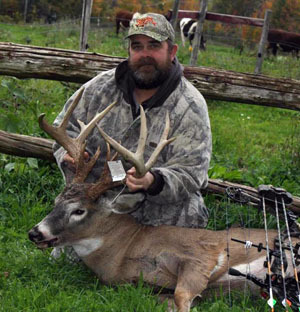 Charlie Ziemer of Brooktondale, NY killed this 12-point in Tioga County with his 30-06. The buck green scored 154 B&C and tipped the scales at 187 lbs. 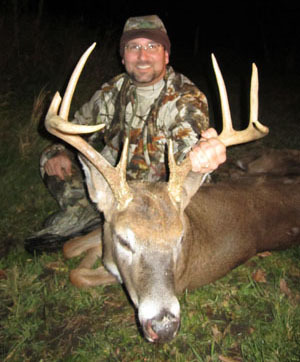 Mark Barber took this double split brow 10-point on Nov. 19, 2011 in Chemung Co. with his T/C Encore slug gun. The buck dressed at 190 lbs. 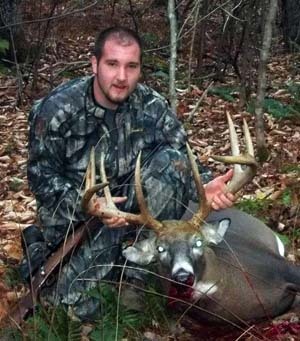 Adam Hayes with his 200lb, 10-pointer that net scored 161. Taken on November 13, 2011. 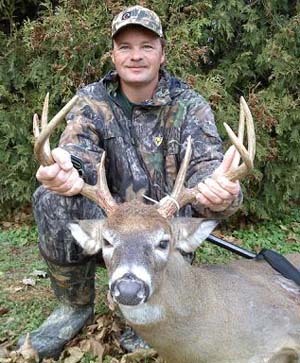 Chris Mumby shot this 10-point on October 22, 2011. 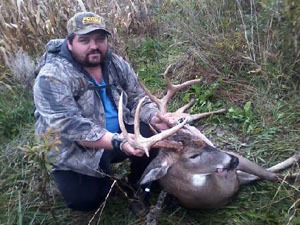 The buck was taken in Yates County. 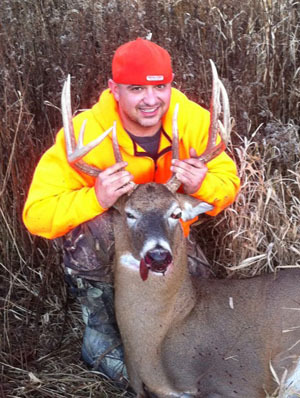 Daniel Face harvested this 11-pointt buck in Rensselaer County in the Village of East Nassau, NY. 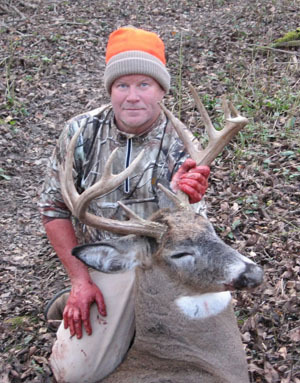 Taken on 11/25/11, this buck was officially aged at 5 1/2 yrs old and green scored 150 5/8. 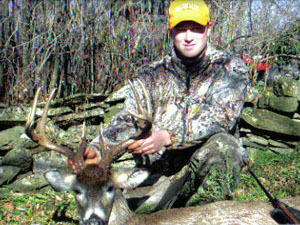 Hunter Michael Thomas bagged this 9-point with an official net score of 131 1/8 on October 20, 2011 at 15 yards with his bow! 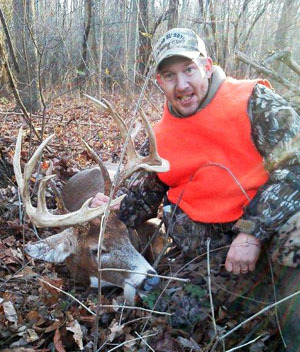 Hunter Dan Wilson bagged this 10-point buck on Thanksgiving morning (November 24, 2011). 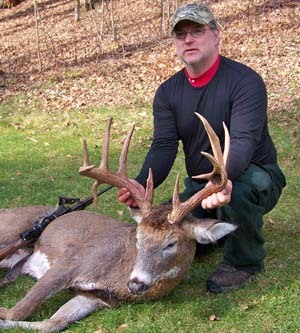 The buck green scored 151 4/8 and was taken in Barker,NY... Town of Hartland with a 12 gauge shotgun. Approximate dressed weight 185 pounds. 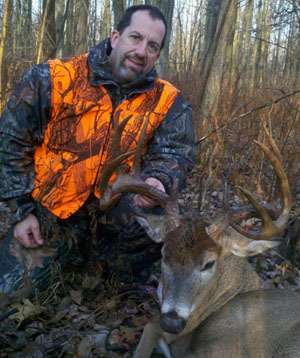 John Volcko shot this 11-point buck in the town of Camillus on 11/19/11. It has not yet been scored. 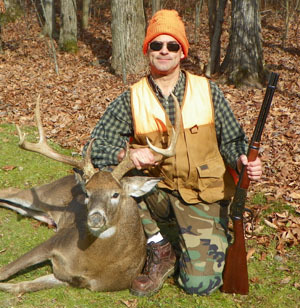 Jeff Diers tagged this 8-point buck in Cassadaga, NY on the afternoon of November 24, 2011 (Thanksgiving) with a Remington 870 12-guage slug. The buck has a 19" spread. 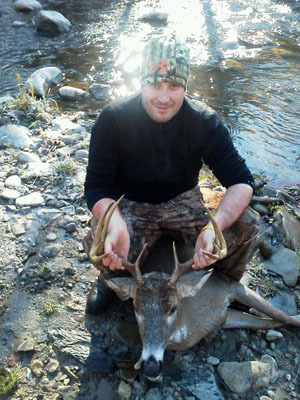 Zach Whittaker took this Chenango County, Town of Greene 11-point on the last day of rifle season. Green score 130". 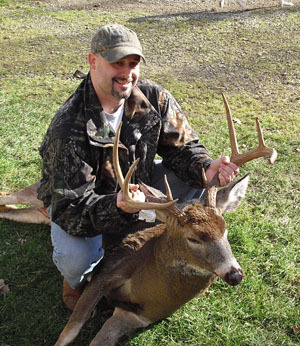 Jeremy Meisenzahl took this 8-point buck with a rifle on 11-19-2011 in Wellsville New York and has not yet been scored. 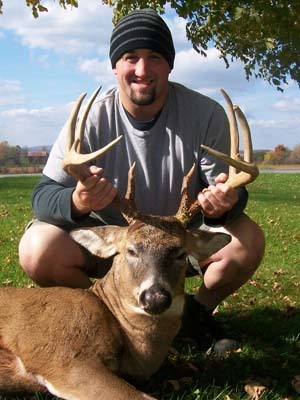 Tim Scanlon of Brewerton NY took this 11-point on opening day 11/19/11, with his 20 gauge shotgun in Tully, NY. The 3 1/2 year old buck green scores 150 and dresses out at 202 lbs. 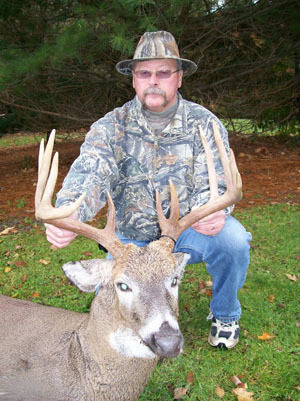 This Tioga County buck was taken by Allen Peterson of Owego, NY on November 19, 2011. It was scored at 140, with 22" inside spread and 24" beams. It was aged at 6 1/2 years old with an estimated weight of 200 lbs. 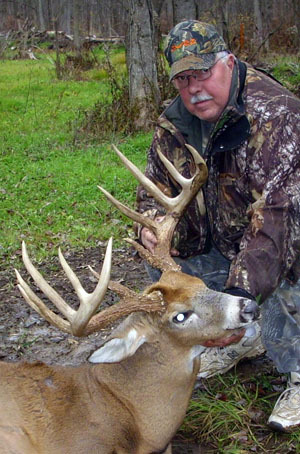 Dave Edwards Sr took this big boy with his bow on October 29th. 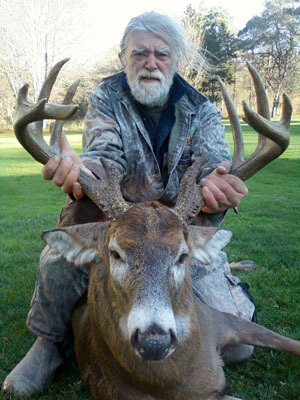 He is the father of Dave Jr. who took New York's biggest typical buck during the 2010 gun season. The buck weighed in at 180 pounds, and grossing 142 3/8, net 130 4/8. 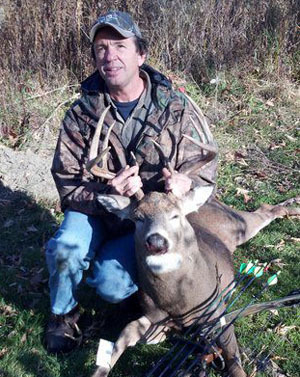 NYS Big Buck Club measurer Gerry Rightmyer and his 2011 archery buck arrowed on October 25th at under 5 yards while hunting from the ground. 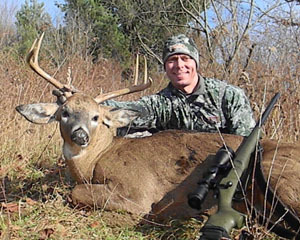 Matt Donohue took this handsome 10-pointer on November 6, 2011 while bow hunting in southeastern NY. His buck green scored 154 4/8 gross and 151 4/8 net. 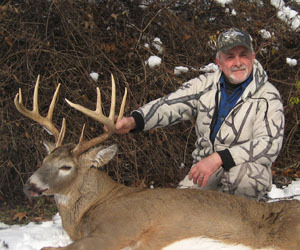 Jim Dowd of Oriskany Falls took this huge 10-point on 11/11/11 while tracking in the new snow. 240 live weight - 203 Dressed weight. 145 Gross green score. 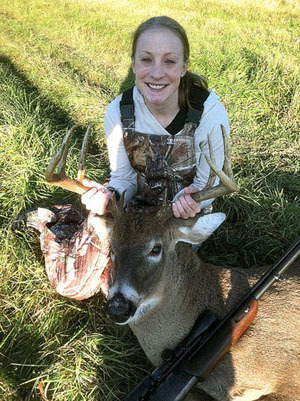 Jessica Murphy, of West Monroe, poses with her first buck ever, a 12-point shot while hunting with her husband on November 12, 2011 in Parish, NY. The buck weighed 165 lbs dressed and was shot with a .222 rifle. 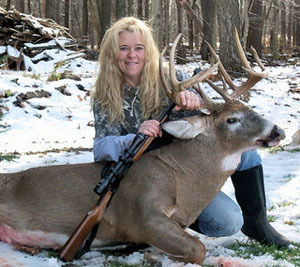 Julie Parker shot this impressive 12-pointer in Oswego County with her 30-30 Marlin. The buck dressed out at 215 lbs. 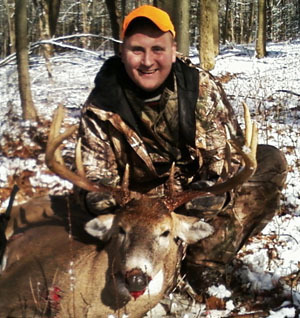 Chris Bauer took this 11-point on 12/10/11 in Cheshire, NY. It was green scored at: Gross 164 / Net 151 and aged at 5-6 years old. 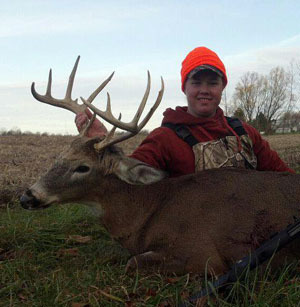 The bucks estimate weight was 185 lbs dressed and he had a 19 inch spread with 11 inch tines.